The Red-billed Quelea Quelea quelea is in the genus Quelea, which contains three species. The origin of the name 'quelea' is unclear but may derive from the English quail, which has the variant spellings 'qualia' and 'qualea'. Queleas are small, short-tailed, sexually dimorphic weavers of moist to arid grassland. They are highly gregarious and colonial, being major granivorous bird pests. They are nomadic or migratory in most regions. Females and non-breeding males resemble non-breeding bishops but queleas have yellow (instead of buff) edges to the primaries - this is visible in photo 2 above. The Red-billed Quelea male in breeding plumage (photo above left) has a mask with no pink or varying amounts of pink around the mask. The mask is usually black but is white in some males (see more photos of head plumage variation here). This variation is to allow individuals to recognise each other. In the non-breeding season the sexes are alike, with a dull brown plumage, and a red bill, eye-rings and legs (photo above right). The Red-billed Quelea is one of the most abundant bird species in the world and its post-breeding population has been estimated to be 1.5 billion birds, leading to its nickname "Africa's feathered locust". It is a significant pest of small grain crops throughout sub-Saharan Africa and is therefore a major threat to subsistence farmers and of economic importance to commercial farmers. Although millions of Queleas are killed each year in government control operations, these birds remain abundant. There are three subspecies in which there are small plumage differences in the breeding plumages of males and it is difficult to delineate the exact distribution of the subspecies as there may be large hybrid overlap zones. 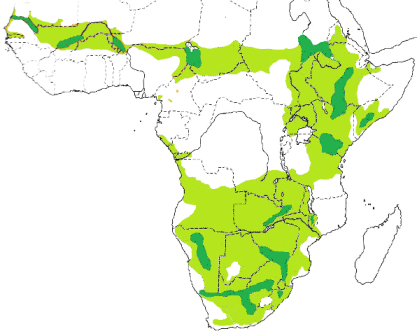 Approximate distributions are: Q. q. quelea occurs in western Africa from Senegal to Chad; Q. q. aethiopica in north-eastern Africa from Sudan to Somalia, north-eastern Zaire, Uganda, Kenya and Tanzania; and Q. q. lathamii in the southern third of Africa. The map (left) shows the distribution of the Red-billed Quelea - the darker green shows areas of high breeding effort. This species is expanding its range into the Western Cape - the most recent report about this may be read here. The Red-billed Quelea is monogamous and breeds in small to vast colonies - in contrast, most monogamous weavers breed as pairs or in small groups. The Red-billed Quelea has one of the shortest breeding cycles of any bird. The breeding cycle takes about seven weeks: nest construction and egg laying overlap and are completed in six days; incubation lasts 9â€“10 days; the nestling period takes 11â€“13 days; chicks fledge at age 16 days and start self-feeding at 19 days, and are independent fledglings about a day or two later. This species also builds non-breeding nests through the year. The birds roost in large flocks in reeds or trees, and they leave the roosts at dawn to fly some distance to forage in the early morning. By mid morning they congregate in smaller flocks near their foraging sites to rest for the hot part of the day. While resting they chatter and build nests, which may be partial or complete structures. These midday roost sites with nests provide important information on where the main foraging areas of this major pest species are. Photo right: example of quelea nests in a midday roost (from phown 1658). PHOWN records for the Red-billed Quelea appear here, and the midday roost sites are here. This is the most abundant weaver species, but there are very few PHOWN records. Please look out for nests of this important species and submit to PHOWN (PHOtos of Weaver Nests) via the Virtual Museum upload site.